Ahh, Vermont. Delightfully scenic, unique, varied and a bit one-off, Vermont. 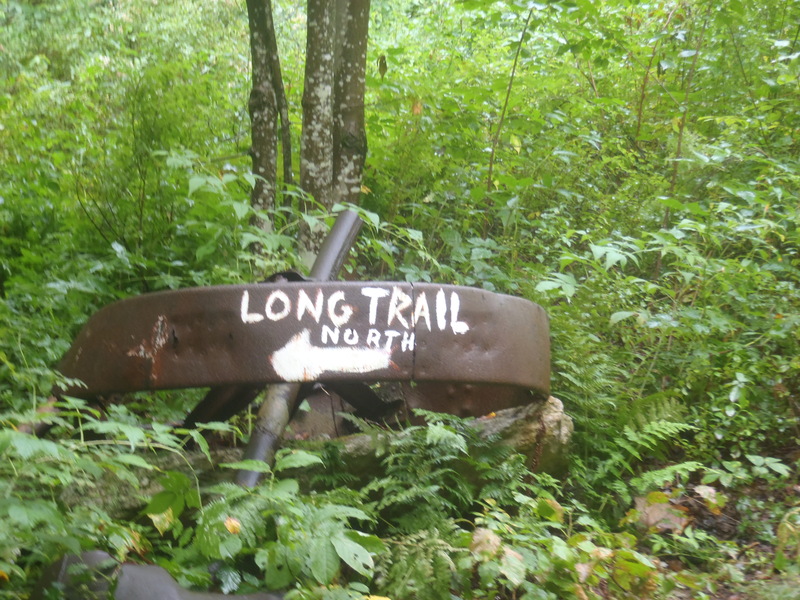 For the first 100 miles of this state, the Appalachian Trail and Long Trail share the same pathway separating just past Rutland, Vermont at the Maine Junction. As you may have read in our previous post, The Slackpack Experiment, we ended our 230 miles of hiking sans-backpack in Bennington, Vermont. Bennington is located only fifteen miles past the Vermont border, resulting in our purposeful decision to put backpacks on at the start of the Green Mountains. Not only did we start back up carrying our houses on our backs again, but we did so at the reappearance of real mountains. 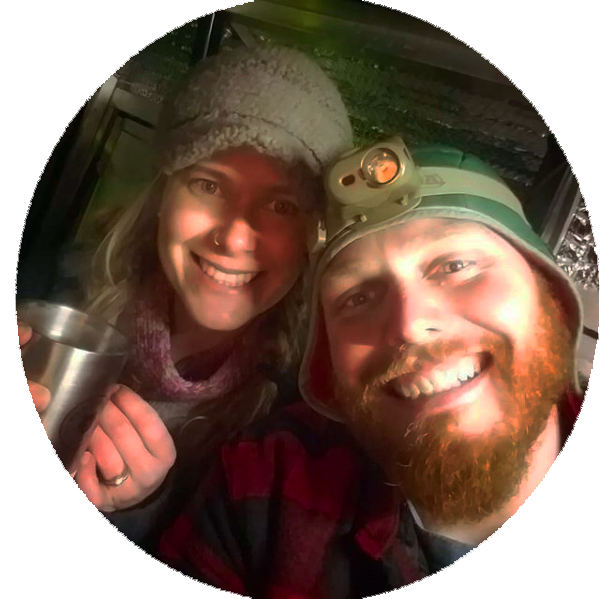 This led to a bit of apprehension about the endeavor to come and whether or not we would be able to make the mental and physical transition to backpacking again. The concerns we had in Bennington were fortunately put to rest as the miles passed easily under our now weighted feet. Since the weather didn’t want to cooperate with us in Vermont I’m at least glad we enjoyed the freedom of having our packs again! 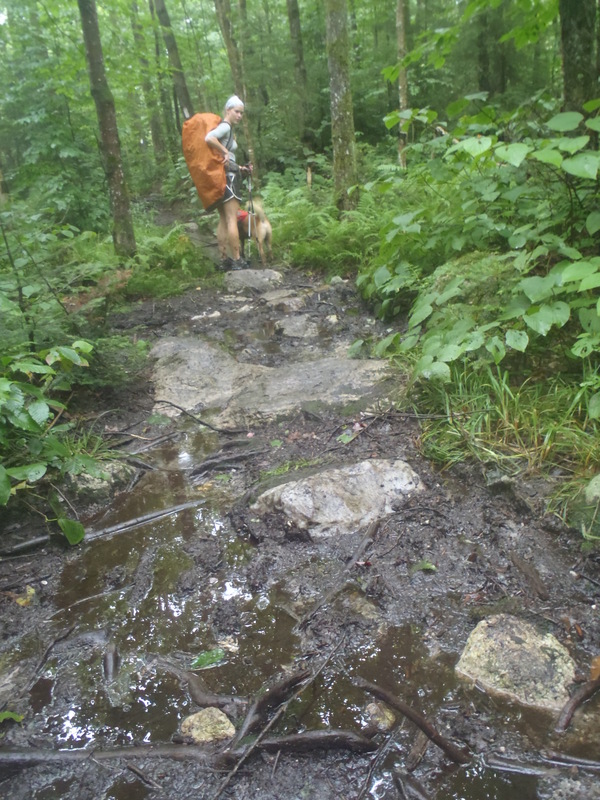 All that stands out to me for the first three or four days walking on the southern portion of the Vermont Appalachian and Long Trail section is the mud. Now admittedly, I likely only focused on the mud because I ignored stopping at any great viewpoint along the way. Then again I guess that could be because we walked through dense fog all day, when we weren’t actively being rained on that is. Yep, for the first several days we slogged, and often playfully splashed like children, through miles of the famous Vermont mud and delightfully persistent rain. Welcome back to the A.T., Fat Kids. 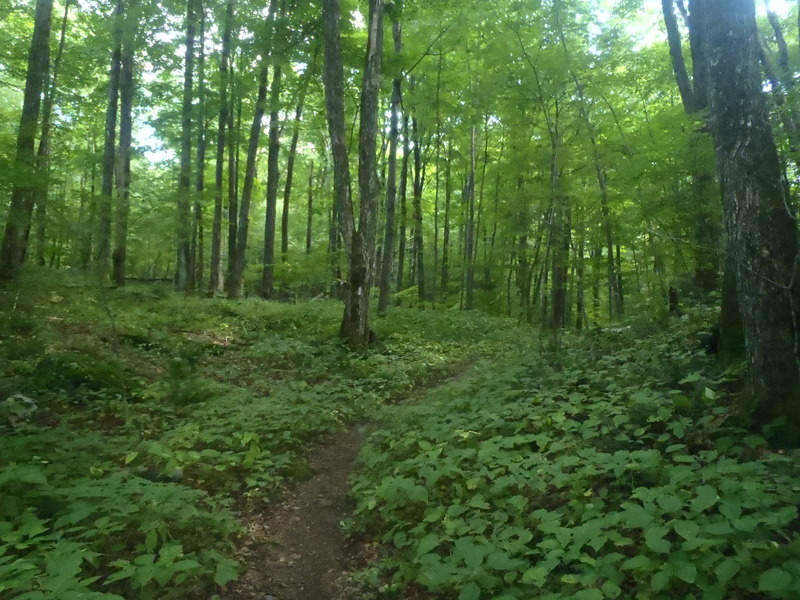 Muddy Vermont trails… okay they were actually kind of fun! Despite the precipitation and muddy paws, even the puppy had a blast being back on the trail. 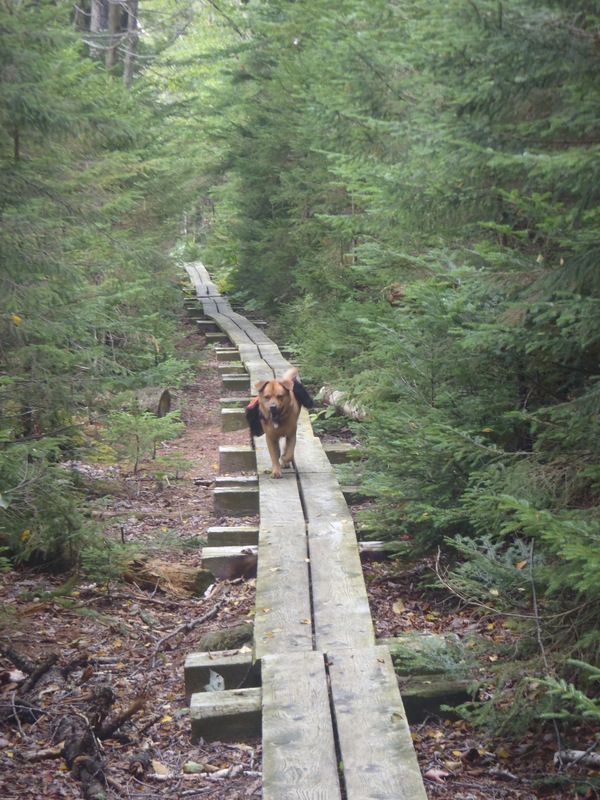 Maybe being on the couch and chasing squirrels out of the garden for a month became too monotonous, but he seemed the happiest we had seen him in a while by getting back on the trail. Hunter wasn’t the only one that had a blast hiking through Vermont, as it turned out that possibly my favorite day on the Appalachian Trail occurred as we walked through the Green Mountains. We woke up at sunrise after having camped in a spruce stand just 50 feet past the granite slabs of Burke Mountain, 30 miles south of Killington Peak, and spent the day walking through some of the most varied and beautiful terrain that we had seen on the entire trail. What makes a one day better than the other 150+ we spent on the trail? Well, cooking breakfast next to a cascading stream with rapids and swimming holes after an easy five mile downhill walk on great trail is a good way to start. We then spent a good chunk of the morning taking easy trail to Little Rock Pond which as it turned out is a crystal clear and pristine, high elevation, glacially created pond that had been carved out of the Appalachian Mountains thousands of years ago. As if it couldn’t get better we spent the afternoon walking through a mature poplar forest that filtered the light through bright green leaves before it hit a dry, rock free forest floor. When the afternoon finally came to a close we made our last climb and came upon two lawn chairs positioned at a viewpoint on the top of a hill overlooking the not-too-busy Rutland Airport and the dozen miles of valley stretching in either direction from the airport. The day ended like many others, at a shelter, except this one happened to be positioned after a 1/2 mile scramble through a near-vertical boulder field that still had cool air pockets from ice in the deep crevices. The shelter sat on the banks of a cold, clear stream with flat soft camping spaces and a great group of fellow hikers to cook dinner with. Not every day was a great one on the AT, but this one sure made the bad ones worth it! This is what Vermont looks like… when it’s dry! After the perfect trail day we had to wake up and conquer the first truly big climb since the southern Appalachians – Killington Peak. 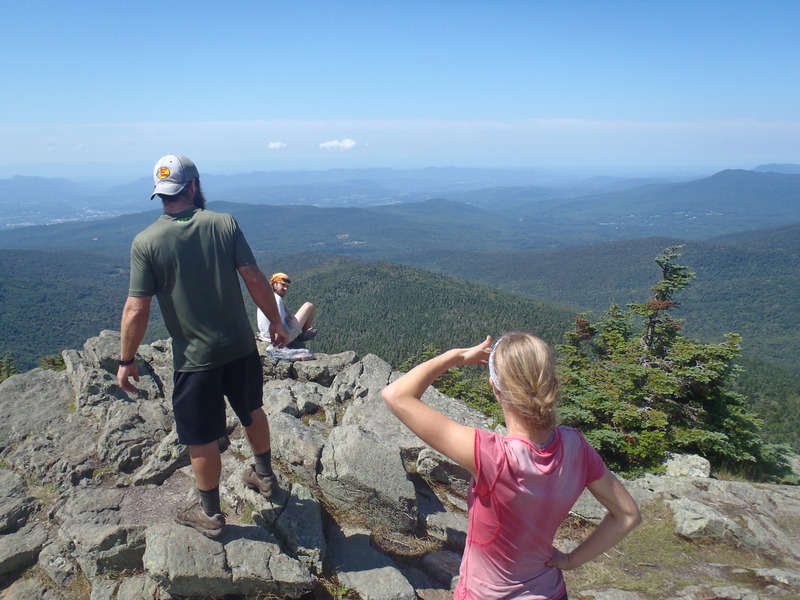 Killington had more bark than bite and ended up being a well graded, mud-free climb over several miles and ended at a decades-old stone shelter just 200 yards from the actual summit. We left our backpacks at the shelter and climbed up the steep rock scramble to the top and came upon a sight that no one expected: people in jeans and a restaurant with beer for sale! You see, there are two ways to get to the top of Killington. You can either hike up the trail for several hours or take the gondola to the top for a fee. Despite the fact that the better smelling tourists gave us thru-hikers a few odd looks, the experience at the top turned out to be a quite positive one. The management for the mountain doesn’t seem to dislike us hikers too much and AT thru hikers can even get a free round trip in the gondola. Lindsay and I missed out on this little novelty because the dog couldn’t go for the ride but that’s a price we gladly paid for being able to hike with him. The day finished up in Rutland, at my roommate from Norwich University’s house, with a few cold beers, a hot shower and some delicious pizza. All in all, another pretty good day spent hiking. Leaving Rutland we turned off of the joint Long Trail/Appalachian Trail and headed east towards the Connecticut River and Hanover, New Hampshire. During this part of our journey we realized why most of the roads in Vermont run north-south; because when you travel east-west you are constantly going up and over mountains! No more ridge lines for us, as we spent more than two days covering the 50 miles that looked more like a roller coaster than a hiking path. 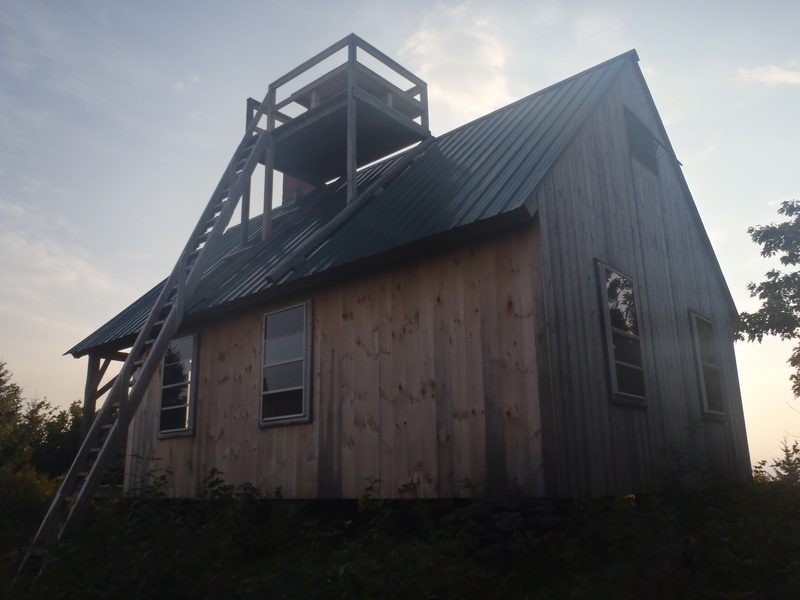 The effort was worth it though when we were able to spend the night at a seldom used cabin on private property that offered a panoramic view stretching from Killington Peak on one side to Mt Washington on the other. The owners of the cabin allow hikers to spend the night as long as they don’t leave a mess and have the foresight (or warning from a fellow hiker) to carry enough water up the mountain to cook dinner with. It seemed silly to push on so we cut the day a bit short and enjoyed a beautiful Vermont sunset and sunrise from a viewing platform built above the roof. All in all, I loved hiking through Vermont. I might not ever plan on doing an epic 6 month thru hike again but I think it would be safe to bet that Lindsay and I will go back and finish the 150 northern miles of the Long Trail before we get too old and decrepit. The Vermont Appalachian Trail had the perfect balance of work vs. reward and if nothing else for us to be drenched the first three days with cold rain and still want to go back, then it must be good!